Sonnenberg Mennonite Church in Kidron, Ohio on 17 August 1950. Source: Mennonite Community Photograph Collection, The Congregation (HM4-134 Box 5 Folder 1 photo 010.4-1). Sonnenberg Mennonite Church (Mennonite Church USA), located in Kidron, Wayne County, Ohio, now a member of the Ohio Mennonite Conference, was founded by Swiss immigrants from the canton of Bern in the early decades of the 19th century. The first settlers arrived in Wayne County in 1819 in what is now the Sonnenberg neighborhood north of the village of Kidron. The congregation made a steady growth but gradually withdrew, culturally, from its kindred Swiss Mennonite congregations in Allen and Putnam counties, Ohio, Adams County, Indiana, and Moniteau County, Missouri. After 1878, when the last conference of all the Swiss congregations was held at Sonnenberg, the congregation, under the wise and able leadership of its bishop (or elder) Christian Sommer (ordained preacher in 1844 and elder in 1862), remained independent, but gradually formed cultural and informal organizational ties with the Wayne County Amish Mennonite and Mennonite congregations. 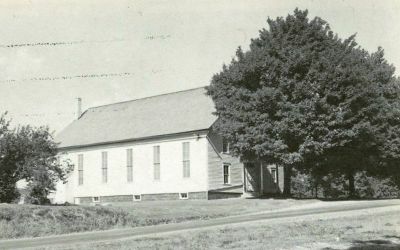 In 1886 a few members withdrew, partly under the influence of the "Oberholtzer" Mennonite school at Wadsworth, Ohio, to found the Salem Mennonite (GCM) Church. In spite of difficulties relating to the transition from German to English and similar matters, chiefly cultural, the congregation continued to grow until in 1935 there were over 500 members. Sonnenberg collaborated more and more with the Amish Mennonite and Mennonite congregations in Bible conferences, Sunday-school meetings, and similar religious activities. In 1935, 330 members withdrew and organized the Kidron Mennonite Church under the Ohio and Eastern Conference. The Sonnenberg congregation suffered a later division which resulted in the organization of the Bethel Mennonite Church (unaffiliated) near Apple Creek, Ohio, with 49 members. The Sonnenberg Church had a membership of 168 in 1957, with Louis Amstutz as bishop and James Stauffer as minister. The congregation met in homes until 1834. The first meeting house, a log structure, served also as a school house. A second building was erected in 1861, and a third meeting house was constructed in 1907. The new 1989 facility was combined with the Fellowship Hall which was originally built as a church school. The church joined the Ohio Conference of the Mennonite Church in 1977. Umble, John. "David A. Schneck's Notes on the History of the Sonnenberg (Ohio) Swiss Mennonite Congregation." Mennonite Quarterly Review 29 (1955): 276-299. Umble, John S. and Richard D. Thiessen. "Sonnenberg Mennonite Church (Kidron, Ohio, USA)." Global Anabaptist Mennonite Encyclopedia Online. March 2014. Web. 23 Apr 2019. http://gameo.org/index.php?title=Sonnenberg_Mennonite_Church_(Kidron,_Ohio,_USA)&oldid=140450. Umble, John S. and Richard D. Thiessen. (March 2014). Sonnenberg Mennonite Church (Kidron, Ohio, USA). Global Anabaptist Mennonite Encyclopedia Online. Retrieved 23 April 2019, from http://gameo.org/index.php?title=Sonnenberg_Mennonite_Church_(Kidron,_Ohio,_USA)&oldid=140450. Adapted by permission of Herald Press, Harrisonburg, Virginia, from Mennonite Encyclopedia, Vol. 4, p. 580. All rights reserved. This page was last modified on 8 November 2016, at 22:50.